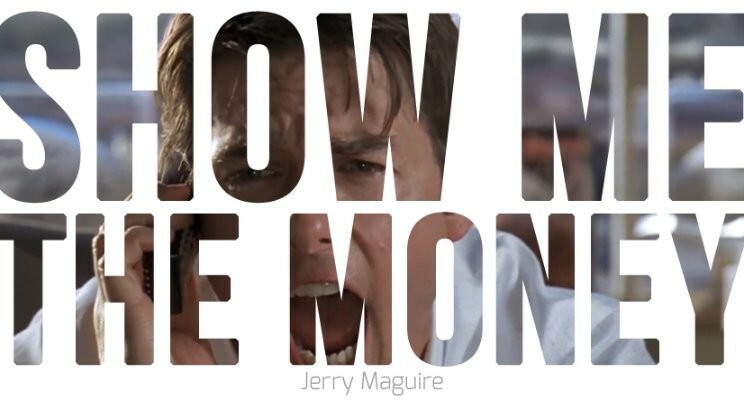 20 years on, why “Jerry Maguire” is still the best movie, about work, life and relationships…. This week I celebrated a milestone: 8 years in a company. Why does that matter? It is not unusual, but from age 25 to 45, I have only had 4 employers and, until now, moved company on the 5th Anniversary every time. So, as I often do, I started thinking about my thinking and the reasons that people leave jobs and companies and that prompted me to think of my favourite film “Jerry Maguire”, which came out just over 20 years ago. I decided to revisit the movie to see if what was so profound, impacting and meaningful then, still holds true now. This is the back story… 20 years ago in December 1996 “Jerry Maguire” was another big hit movie for Tom Cruise. As a young 25 year old executive who had just landed a new job, it was hugely insightful and still is. In my opinion it was ahead of its time in defining what is all-important in life, career and business: Personal Relationships. Being in the ‘people’ or ‘human capital’ business arena the past twenty years, you spend most of your days, like “Jerry”, focusing on the lives, career, progression and personal development of others. In over 20 years I have interviewed over 10,000 people for 500 senior roles across the globe. As a business-to-business sector we are commonly accused of being client first and candidate second in our handling of the hiring process. It is fair to say that this is how the recruitment and executive search industries make their money; the client creates the demand and pays the bills. It would also be fair to say that the candidate, or talent, as in the movie, has somewhat become a commodity to be traded and exchanged in order to make a profit for companies. Since the mid 1990’s we have seen a huge shift in the impact of technology, the internet, online hiring, LinkedIn, connectivity and unrivalled access to all the talent in the World. We were warned of the ‘war for talent’, people voting with their feet, the backlash against corporate culture, ‘Millennials’ and whatever the next trend maybe including artificial intelligence and the impact of robots on the workforce. Very little has changed, in my opinion, in the way that human beings want to be treated. Ultimately, for the 500 senior roles that I have hired for leading companies across the globe, those that got the job were largely happy, they were the lucky ones! For each successful hire there may have been 50-500 people in the process that were either reject or disappointed So we actually only managed to please and deliver for maybe 1% of candidates. The other 99% were left largely dissatisfied. In the movie Tom compromised his job, his future and ultimately focus on people and the 1% of relationships he valued. Wind the clock on 20 years and with over 40,000 hours of experience ‘observing’ people, and behaviour I firmly believe that in your career and life there are three distinct phases and it is only at the end of each do you get the chance to stop, look back, reflect and move forward to the next. During each of those critical periods of reflection, specific elements and people influence you and form the basis of your decisions. Very often it is the leaders, managers and influence’s in your circle that determine your outlook and your future. Those are you guiding lights, your mirror, your point of reference and reality. In this phase you know nothing – you learn from the people around you: parents, relatives, friends and teachers. You develop yourself and your education fairly randomly with influence pulled from a relatively narrow sphere of influence. You are told what to do, what to study and where to focus, or not focus. Essentially, you are not in control of your decisions or your life. You make choices and embark on a higher education and job, which becomes a career. Based on phase 1, you will have chosen, or stumbled, on a role and career. Then, if you had any ambition at all, you spend 20 years working to be better than the next guy, beat the competition and be recognised within the organisation or industry as being at the ‘top of your game’ or ‘top of the tree’. You probably had mentors, even coaches and leaders to inspire you and you looked to emulate them. You were constantly comparing yourself with your friends and colleagues and judging your success relative to theirs. You were constantly climbing, focusing on the next ‘rung on the ladder’ and chasing the money and dream, or illusion, all focused around an aim or goal you ultimately did not choose in Phase 1! I think shortly we will be able to define a 4th phase due to longer life expectancy and medical advancement we are living longer to 80-100+ and therefore retirement at 60-65 may not be an option for many financially or mentally. We see more and more executives, wanting to and having to work beyond 70 years old. I will reveal more in my next article “ The Death of Retirement”. So, after 20+ years of work and continual study of human performance and leadership in business, in 2014 started looking much deeper into what makes people ‘tick’ and ultimately successful in work and life. Via deep research in the field of neuroscience, I started really studying and understanding the science of human behaviour and started to understand the brain and the thinking behind our decision-making, interactions and relationships. In the movie, “Jerry Maguire” spent hours thinking about his thinking and subsequently wrote a document “THINGS WE THINK BUT DO NOT SAY” which defined his future by saying what he really thought about his industry. By deep thinking and speaking up, he ultimately got fired! In 2016 I did the same for myself. It didn’t get me fired thankfully, but the point of revisiting the movie was to see if things I believed in then are still as true and important now. To quote Jerry again is ” in this volatile, cruel and cynical world and that we all need something to cling to and the key to life and business is the same thing – personal relationships”. · Define for you what is ultimately more important than anything else, whether it be morally, financially, or anything else and live or die by those rules. Pursue those dreams and do not wait until you are 45-55 to choose what you really believe will make you happy in work or life. · Be happy to fail, comfortable to walk away, stand up for what you believe in. Even with all of the technology and social media advancement, you personally are the other thing that can impact this world and the people around you. · Finally, if you do nothing else, focus on people and relationships; Friends, Family, Kids, Parents, Colleagues, whoever is important to you. Technology has yet to replicate how powerful the brain is and the impact that honest communication and emotions have on those around you. “People may not always remember what you said or did, but they will always remember how you made them feel”. In the words of Dicky Fox at the end of the Movie: “Hey, I don’t have all the answers. In life, to be honest, I failed as much as I have succeeded. But I love my wife. I love my life. And I wish you my kind of success”.